Notes from real scientists and engineers working on space and Earth-from-space missions . . .
Every spacecraft requires engineers to build and operate, and scientists to determine what information the spacecraft will gather and to study the data once it is on the ground. Engineers and scientists are very different groups of people, with different priorities, and so they need someone who sits in-between them to help them work together successfully. That’s where I come in. I am a scientist at the Jet Propulsion Laboratory who works embedded in the engineering teams for two different spacecraft, Mars Reconnaissance Orbiter and Mars Science Laboratory, which you may know better as the Curiosity rover. My science background lets me understand the concerns, priorities, and language of the science team, while my engineering experience lets me understand the limitations that our hardware and software place on the operations team. Using its robotic arm camera, Curiosity took a set of images that scientists stitched together to create this "self-portrait." For Curiosity, most of my work has involved making sure that the science team has the tools and the training to allow them to assemble a plan of the science activities for the rover to carry out each day. This responsibility included putting together the procedures that a science team member follows to get an activity into the plan. What are each of the steps involved? What exact information is provided to the engineering teams at what time, and in what format is that information? These were all questions that had to be considered, and the answers had to be fine-tuned as we went through our practice runs at rover operations (called Operational Readiness Tests) before Curiosity landed on Mars in August. During the first 90 days of the mission, all of the science team moved to Pasadena and worked in the same building as the rover operations team. The scientists were able to debate face-to-face over what observations to take, work directly with the engineers that turned those decisions into commands for the rover, and to cheer as the data came down from Mars. Curiosity performs series of tests with the robotic arm on a rock nicknamed "John Klein" to prepare for the first drilling to collect a sample of rock material on Mars. However, no matter how awesome it is to be telling a laser-shooting robot on the surface of Mars what to do, at some point you want to go home, see your family, and sleep in your own bed. We needed to make sure that when our scientists returned home (all around the U.S., and also many countries including France, Spain, Canada, and Russia) that they were still able to do all the things that they had done here in Pasadena. How could scientists scattered across the world look over each other’s shoulders as they built a plan, and make suggestions and changes and quibble with each other’s decisions? Ultimately we turned to a variety of web-based tools, including desktop sharing programs and teleconference lines to replicate individual meeting rooms, and a chat server to simulate being able to run around the floor to find someone who can answer your question. Getting our 400 scientists and 300 engineers switched over and comfortable with these tools was my job. It took a lot of troubleshooting and required patience, but the team has been operating under these new conditions since the start of November and it seems to be working well. While my work on Curiosity is done and I’m moving on to another project, I’m pleased to know that my efforts will help the rover operations team do amazing things on the surface of Mars for years to come. This entry was first posted October 17, 2012, on "My Big Fat Planet," a blog on NASA's Global Climate Change website. I was a musician working at a Pizza Hut before beginning college which, in my case, was synonymous with poor. Looking for a brighter future (i.e., more money), I enrolled at Kansas State University as a computer systems major. The alluring thing about this major for me was that it required creative problem solving and had the promise of big bucks. During my time there I learned about programming and computer hardware. However, the most important thing to happen to me was a course I took in calculus. Before I started college I assumed that math wasn’t for me. As it turned out, I found mathematics very intuitive. I enjoyed the creativity and elegance that came with problem solving, much like the creativity I enjoyed playing music. My original childhood passion was astronomy, and if I enjoyed mathematics then I reasoned that I could do well studying astronomy or physics. With this in mind, I wrapped up my associates degree in computer systems and changed majors to physics in which I earned my bachelor’s degree. I became interested in the physics of light and lasers, so I did research as an undergraduate in a high-intensity ultrafast laser facility at the James R. Macdonald Laboratory at Kansas State University. I wrote computer code for graduate researchers that helped with their experiments and also spent six months assembling a laser system. 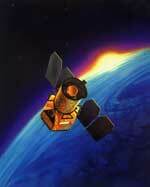 Artist's rendering of the CALIPSO satellite. In graduate school, atmospheric science was an attractive path because I could apply the physics I learned to important problems such as climate and climate change. When I sent out my application to graduate schools, my soon-to-be advisor at the University of Illinois at Urbana-Champaign saw that I had experience with lasers and thought that I could work with data from the new (at the time) Cloud Aerosol Lidar and Infrared Pathfinder Satellite Observations (CALIPSO) satellite, which uses lasers to study the atmosphere. 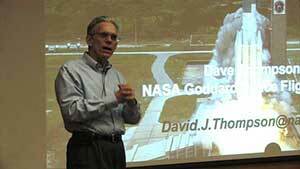 I hadn’t thought about working with satellites before I met him, but because it sounded interesting and involved lasers and the physics of the atmosphere, I jumped on board. I spent the next two years studying CALIPSO measurements to learn how aerosol properties change near clouds—a topic of significant uncertainty in climate science. Eventually, I was ready to look for a job and, as it happened, an opportunity opened up for an analyst with the CALIPSO science team at NASA Langley Research Center. Since I had been working with CALIPSO data for two years and my interest in optics and aerosols fit in well with the team, I was offered the job, which I eagerly accepted – and every day since I have been glad that I did. 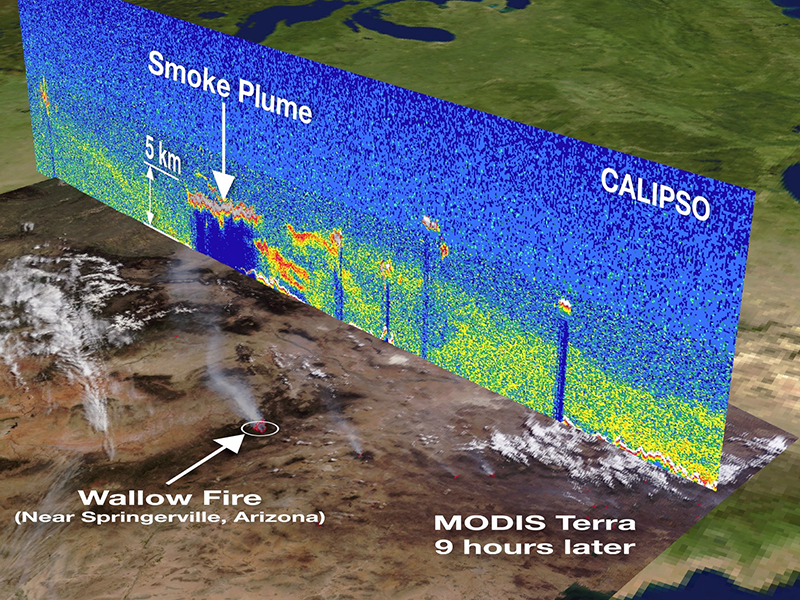 A CALIPSO vertical profile from space shows the smoke plume on June 3, 2011, from wildfires raging in Arizona. It is overlaid on an image captured by the Moderate Resolution Imaging Spectroradiometer (MODIS) instrument on the Terra satellite nine hours later. 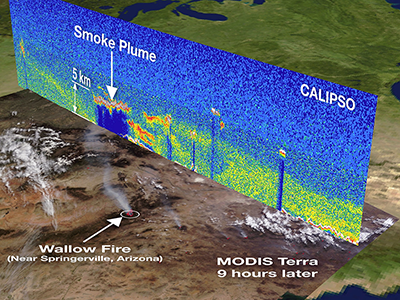 The data shows that the Wallow Fire smoke plume reached heights of 5 kilometers ( 3 miles) high. CALIPSO and Terra are part of the "A-Train" constellation of five Earth-observing satellites. Credit: NASA /Kurt Severance, Jason Tackett and CALIPSO Team. Working for the CALIPSO satellite mission is very exciting. I get to find creative solutions to complicated problems and work with scientists to understand what data from CALIPSO is telling us about Earth’s atmosphere. In April 2010, I worked with colleagues to examine the distribution and optical properties of volcanic ash that had erupted from the Icelandic volcano Eyjafjallajökull and disrupted air traffic in Europe. NASA Headquarters asked several Earth observing satellite groups, including ours, to help identify plume location and provide guidance to air traffic controllers. Since I have been with the CALIPSO team, my colleagues and I have also developed products for near-real time air quality monitoring and for climate modelers. I feel immense satisfaction that I work with a team that provides the high quality data that climate researchers need to solve the important issue of climate change. It hasn’t been a straight path to get where I am today, but I am very happy with where I’ve landed. 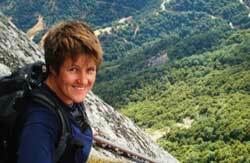 My name is Christy Hansen, and I'm the Project Manager for a NASA Earth Science mission called Operation IceBridge. We fly aircraft over Earth's polar regions to collect data on ice sheets, glaciers, and sea ice. Our airplanes have instruments that measure the elevation and thickness of the ice. As we collect data over the same areas each year, we can monitor how the ice is changing. The information we collect can be used in scientific models to better predict the future. These models will help us to answer key questions such as: is our polar ice disappearing? Why is it disappearing? Will sea level rise, and if so, how fast? Will these changes in ice affect the communities of people and wildlife who live in our polar regions? Each year, our team of scientists, instrument engineers, and flight crew deploy to both the Arctic and Antarctic regions. Early in the year, we fly up north, collecting data over Greenland, northern sea ice in the Beauford and Chukchi seas, and the Canadian Basin. Toward the end of the year, we typically go to Punta Arenas, Chile, basing our aircraft out of the southern-most tip of South America. From there, we fly over Antarctica, collecting data on the changing ice sheet, outlet glaciers, and surrounding sea ice. For these flights, we don't ever actually land on the Antarctic continent. Recently, we have been asked to consider moving our southern IceBridge operations from Chile to the Antarctic continent itself. By doing this, we could reach new scientific targets, as well as get more science data collection hours by starting off directly from the ice. Here is a panorama I took standing on a small look-out point called Hut Point. You can see the sea ice in McMurdo sound in the right of the photo, and toward the very left, you can see some of the buildings in McMurdo town. That big hill in the background is called Observation Hill. Where can we land our airplane? What are the constraints and rules of working on an ice runway? Where can we fuel our plane? What kind of support equipment do you have to support any maintenance we have? How do we work within the existing infrastructure? What if a storm comes in? How can we get power to heat our instruments while they are at the runway? What if we lose power? Can we do any data processing? Can we get internet, phone, storage space, and what kind of temporary buildings can we use to protect us and our equipment from the harsh environment? Where can our team sleep, eat, and work? What transportation is available to take us to/from McMurdo town all the way out to the ice runways? Are there any recreational activities? Here's the coffee bar, one recreational option. The trip request was a real surprise. Before I knew it, I was visiting 5 different doctors to see if I would pass the strict medical and physical qualifications required by the National Science Foundation. And then, I was off to Christchurch, New Zealand, where I spent two days with my team getting my extreme cold weather gear and watching multiple orientation videos on McMurdo and LC-130 safety. The LC-130 is a military, four-engine turbo-prop aircraft used to transport cargo and people to and from Antarctica. Its landing gear are skis to allow it to land on both hard ice and snow runways. Then, on December 7th, we all boarded the LC-130, wearing our huge red parkas and warm bunny boots, which everyone must wear during the “ice flight” into McMurdo. We were essentially crammed in, face to face, for eight hours. But it was worth it! We landed and stepped out onto the Ross ice shelf for the very first time. The ceremonial South Pole has flags from 50 nations which have agreed to keep Antarctica for peaceful and scientific purposes. The next morning, we boarded the LC-130 headed for the geographical South Pole, latitude 90 degrees south! It was a three-hour flight. Then we had only 30 minutes to see the historic geographical and ceremonial South Pole markers. It was -15 degrees F, which the "natives" considered warm. The elevation at South Pole is ~ 10,000 feet, so in addition to the cold, we could feel the effects of the altitude. I tried to absorb what it meant to be at the bottom of the world, and take in the feel, sound, and history. Awesome. The remainder of the trip was very successful. We met some great ice contacts and experts in their fields. Our team learned a lot and as an added bonus, got to experience that polar explorer feeling for a bit. Life in McMurdo is actually pretty comfortable, as it is not a true field camp. There are heated buildings, recreational activities, a coffee bar, four gyms, and my favorite of all: an ice cream machine called “Frosty Boy” that is open 24/7. He became one of my best friends. 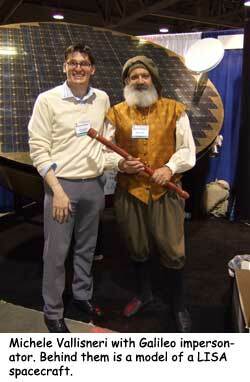 If we move our team to McMurdo, we will need something like this tent. It is equipped with heat, internet capability, workspace, a phone, power, etc. There is a huge science lab with an aquarium, a library, a weather station, and a small church. The whole town is situated on volcanic rock. And in direct contrast to that, McMurdo, situated on what is called Ross island, is surrounded by sea ice and a permanent ice shelf. We could even see seals resting down on the sea ice. I will never forget my experience there, and the great team of people who traveled with me, and who we met on the ice. For more information on Operation IceBridge, please visit our website at: www.nasa.gov/icebridge. I turned on my computer this morning in anticipation, as I have every day for the past four and a half years. What astrophysical surprise would Fermi provide today – a new pulsar or blazar, a gamma-ray burst, a nova, a solar flare, or perhaps some new insight about dark matter? Fermi is the Fermi Gamma-ray Space Telescope, an international space mission operated by NASA and the Department of Energy, circling the Earth every 96 minutes since June, 2008. Its two scientific instruments are studying gamma rays, the most powerful form of light. What makes gamma rays interesting is their high energies. It takes a lot of energy to produce a gamma ray (millions or billions of times more energy than needed to produce the light we see with our eyes), and so anything we see with a gamma-ray telescope is inherently something powerful. Fermi is also unusual because its instruments see the whole sky about every three hours. That feature is important, because the scientists who use Fermi can compare today’s view of the gamma-ray sky with yesterday’s or last year’s. 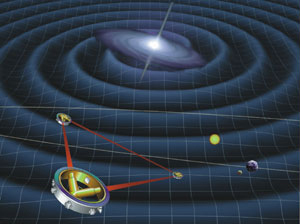 The gamma-ray universe is a dynamic one, constantly changing on time scales ranging from fractions of a second for gamma-ray bursts (which are probably related to exploding stars) to years for some bright galaxies (many of which have jets of material pointed toward the Earth from distant parts of the cosmos). I watch the gamma-ray sky every day (along with Fermi scientists scattered around the world), because part of my job is called “multiwavelength coordination,” which involves communicating with scientists who use other types of telescopes. By looking at an interesting cosmic source with many different instruments, we learn more than we can from any one sort of observation. I frequently help contact radio, optical, X-ray, or other gamma-ray astronomers to let them know that something interesting is happening in the sky, or to ask them if they have seen something we should look for in the Fermi data. I also check the literature, because it is possible someone has found something using our Fermi gamma-ray data, which all become public immediately. As it happens, nothing spectacular turned up from Fermi today. Maybe tomorrow or the day after. There have been enough surprises from our satellite that I know it is just a matter of time. Dr. Thompson gives a talk at a conference of the American Astronomical Society. 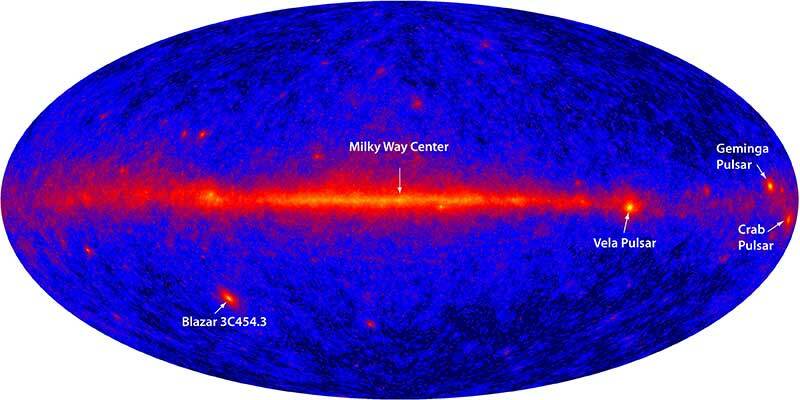 For further information, see the Fermi Gamma-ray Space Telescope mission page. My name is Tim Schmit, and I do research and help weather forecasters make the best use of the information available from environmental satellites. Specifically, I work with the Advanced Satellite Products Branch, which is part of the National Environmental Satellite, Data, and Information Service Center for Satellite Applications and Research. We are operated by NOAA (the National Oceanic and Atmospheric Administration) and located in Madison, Wisconsin. NOAA's National Environmental Satellite, Data, and Information Service operates the nation's civilian environmental (weather) satellites. My interest in remote sensing started with my dad, who helped to design some of the first infrared sensors in the world. When I was in 7th grade, I decided to get a master's degree in meteorology from the University of Wisconsin in Madison. And that's exactly what I did—a bit later! Sometimes I think I have the best job in the world. A favorite part of my job is when we are the first to check out a certain aspect of imagery from a new satellite. The initial images are always exciting, since they demonstrate the many components of the satellite that are working together. GOES-East satellite (combining the GOES cloud information on a color background map from another satellite). Credit: NOAA. NOAA keeps two satellites in geostationary orbit, each in a spot approximately 22,000 miles (about 36,000 km) from the Earth's equator. This position, which is stationary with respect to the ground below, allows the satellites, known as Geostationary Operational Environmental Satellites (GOES), to keep watch over the Western Hemisphere and parts of the Southern Hemisphere. But, before these satellites can be used operationally, they need satellite research meteorologists to make sure everything is working properly and to help convert the satellite data into meteorological information that can be used for important weather forecasts and warnings that can save lives. Hurricane Katrina, as seen from the GOES-12 Imager. This is a 'water vapor' image, where the white colors are clouds and moisture, while the darker colors represent warmer/drier regions. I'm sure you have seen GOES "infrared" images on your local TV station, such as images of hurricanes approaching the U.S. The GOES are not only used for weather applications for the nation, but also for space weather, oceanography, hazards, climate monitoring, data collection, and search and rescue applications. These satellites are so important because they can monitor huge areas of our hemisphere that are not monitored in other ways. It's amazing how our natural environment can be monitored in such detail from a satellite located a tenth of the way to the moon! The GOES series is developed by a joint National Aeronautics and Space Administration (NASA)-NOAA-Industry partnership, launched by NASA (with industry partners) and operated by NOAA. While the current generation of GOES gets the job done, the next generation will be far superior! 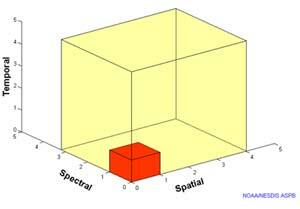 Small red cube represents data output of current GOES imager, while the yellow cube represents data output of the new advanced imager on GOES-R. 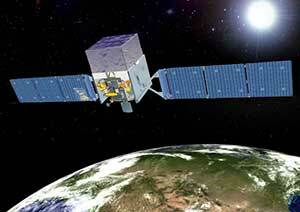 The GOES-R Series is the next generation of NOAA geostationary Earth observing systems. The Advanced Baseline Imager will provide much more information with higher resolution and faster coverage than the current system. With 60 times more data available, GOES-R will improve the monitoring of storms and natural hazards such has volcanic ash clouds or fires. The most exciting part of the new imager will be the rapid-scan images. We will be able to see animations of events such as hurricanes, lake effect snows, convection, fires and more over various small regions of interest every one minute! We will be able to watch the phenomena almost as they happen, not just at the 15- or 30-minute intervals that we have today. 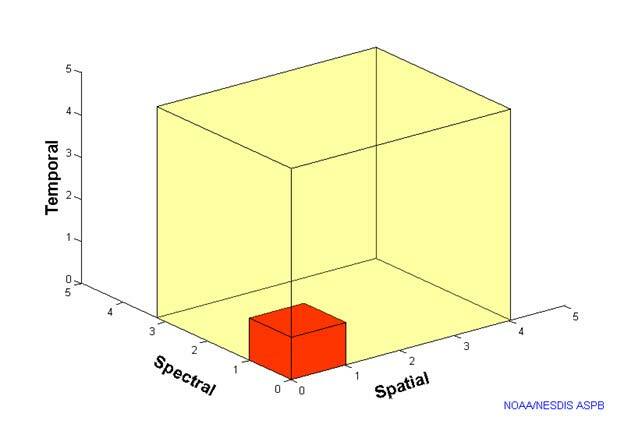 When I started working on GOES-R in 1999, the Advanced Baseline Imager had only eight proposed spectral bands, but a host of requirements from the National Weather Service. I was able to get eight more bands added to the instrument, so that the sensor is going to be much more capable and fulfill more of the National weather Service's needs. 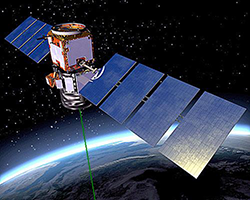 The first GOES-R satellite is planned to launch in October 2016. I am proud that we have been able to use our satellites to improve monitoring of hurricanes and other storms. I am proud of our whole group, including researchers from the government and universities, the private sector (to build the instruments and help send out the information), and, of course, NASA and NOAA to integrate and operate the satellites. I can't wait until the next generation offers even better monitoring! My name is Ben Toyoshima, and I've had the luck of Forrest Gump to get pretty good seats in the Mission Support Areas (MSA) for several NASA deep space missions. The MSA is the room where we actually "fly the spacecraft." That is, we work on the computers that are in direct communication with the spacecraft, via the giant Deep Space Network antennas here on Earth. I am a Mission Controller, also known by network call sign "ACE." There is always an ACE on duty. Sometimes, he or she is the only Project Flight Team member in the MSA or—in the middle of the night, for example—maybe even on the whole Jet Propulsion Laboratory campus. Deep Space 1 zipped past Asteroid Braille at a distance of only 26 kilometers (about 15 miles). The most exciting times for an ACE are when the spacecraft is undergoing a major milestone "state change"—being launched, flying close to a target for observation (like an asteroid), being inserted into orbit (like around a planet), smashing part of itself into a something (like a comet), or landing on something (like Mars). Those events are really important to the success of a mission, and usually all the Flight Team subsystem engineers are together in the MSA. Occasionally, an event also becomes a Big Deal with the media, dignitaries and our bosses right up to great-great-grandbosses at JPL and NASA headquarters. But space is big, so most of the time for ACEs like me, we're just cruising. Getting to Mars, for instance, takes months. Getting to more distant planets takes years. Nonetheless, there is always routine stuff going on like calibrations, flight software upgrades, flight system maintenance, and rehearsals for the next big event. In general, only small state-changes are happening attended by only few of the subsystem engineers—no press, no dignitaries. In those baseline cases, the ACE ensures that the ground resources that support all missions—like Deep Space Network antennas, receivers, demodulators, decoders, and transmission lines—are configured properly for the specific spacecraft being tracked, and that the data is getting into the MSA and databases OK.
One of the 70-m diameter Deep Space Network antennas that communicate with faraway spacecraft. As Earth turns, an antenna at one of three DSN locations around Earth aquires the spacecraft's signal, as the downlink is lost by the antenna rotating out of view. The ACE makes the mouse click that sends data and instructional files to the spacecraft and then waits for the spacecraft's acknowledgement that it has received the data error free. The ACE watches for discrepancies between predicted and actual data. Through simulations and modeling, we have a pretty good idea what the spacecraft and its long-long communications link should look like and if there are discrepancies, it's the ACEs job to recognize, characterize, and triage them. For instance the strength of the spacecraft's downlink carrier signal might be lower than expected. That might be caused by rain, or snow, or hail at the station. Or it could be because of an error in the predictions of where either the spacecraft antenna or the DSN antenna should point in order to acquire and follow the signal. Or maybe we've had a real hardware problem on-board. Click to see animation of Mars Rover (7 months after launch) entry and descent through the Martian atmosphere, then landing and bouncing on its airbags along the Martian surface. The two largest state changes occur at launch when a flight system accelerates from zero to 17,000+ miles per hour and then when it transforms itself from a tightly packaged, encapsulated machine into a real spacecraft, with its communication antennas, solar panels and science instruments deployed. The complementary case is when, the spacecraft transforms from a very energetic flying body to one at rest on some extra-terrestrial body like a planet, moon, or comet. A LOT of energy is either imparted or dissipated from those machines in a very short time. That's scary. So we think a lot about all the things that can go wrong. We write contingency plans and rehearse them. We spend a lot of time and energy preparing. So our job can be very exciting—nerve-wracking, actually, thinking about all the things that might go wrong. What if the rocket was slightly off course or a lander comes to rest upside down? After a major state change, there is a window of time during which we expect to hear from the spacecraft (called acquisition of signal, or AoS). We rarely have AoS at the earliest possible time. So then we wait. The passing seconds and minutes feel longer and longer. And the MSA gets really quiet and tension mounts. Everyone in the Mission Support Area anxiously awaits the signal that will tell them that the rover Spirit has had a successful entry, decent, and landing on the surface of Mars. We knew the rover successfully shed all its speed, had touched down and was now bouncing on the surface of Mars. It did not just SPLAT! and break into a million pieces. We were bouncing on the surface of Mars really-really high, still trying to shed some of the energy the Delta rocket gave us months before during launch. California Governor Arnold Schwarzeneger and former vice president Al Gore are on hand to congratulate the Mars Rover team. Every year in September, I visit the UK for three weeks to work with my colleagues from my time as a graduate student. Five years after graduating from the University of Southampton, I still have a great working relationship with my Ph.D. advisor and a number of other scientists in the UK. This three-week stint is like a magical mystery tour for me—the chance to do my own science, and a reminder of how being on the very cutting edge of any field can be both incredibly exciting and unbelievably frustrating. For 49 weeks of the year I work at the Infrared Processing and Analysis Center (IPAC) at the California Institute of Technology. I split my time equally between the NASA Exoplanet Science Institute (NExScI), and NASA's Spitzer Space Telescope. I absolutely love my job. 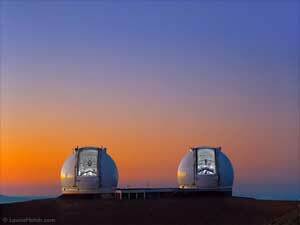 When working for NExScI I'm either organizing conferences and learning from the experts about the chances for life on distant worlds, or I'm touring the enormous Keck telescopes in Hawaii, or travelling across country to represent the Institute at scientific conferences. With Spitzer, I'm standing in front of a roomful of 7-year olds, telling them about the awesome grandeur of the Universe, or working with scientists to write their press releases on their groundbreaking results, or I'm writing a video podcast script to teach schoolchildren about how stars die. I'm astonishingly lucky to have such a varied and interesting job, and it's a rare day when I'm not excited to be making my way into work. Having said all of that, there are some moments when I have a craving for my time as a grad student—to those halcyon days when I had nothing to do but my own (and my advisor's) research. Long weeks stretching out before me, where my only responsibility was to finish writing a program to model our latest theory, and the only emails I got were either from my advisor or from my friends telling me about social plans. These three weeks in the UK are my annual journey back to that time. I'm lucky enough to work for an organization allows me to leave my usual duties, to sit in front of my laptop in my Ph.D. advisor's office and work with him on our own research again. Suddenly I find myself engaged in my own science, looking at the remains of ancient planetary systems around dying stars, millions of miles away. It's incredibly exciting to suddenly be back on that edge of discovery, looking at images of these stars that no one else has seen, making the plots and running the modeling code that will tell us about the make-up of these distant solar systems. Then about 2.5 weeks into this venture, we realize that the modeling code is telling us something unexpected, that we're going to have to revise our theory to account for the new findings, and the paper that we were planning to have written up and submitted for publication by the end of the month is probably going to take another six months to finish. It's at about that point that I start dreaming of easier times: organizing conferences, writing podcasts and enthusing young students about the birth of the Solar System. It's with a feeling of relief that I arrive back in California to get stuck back into my usual routine again, but I'm very aware of how the annual time-out makes my day job far more satisfying. With a balance of science and education work for the majority of the time, plus the ability to turn back the clock for three weeks a year, I'm regularly reminded how much more I enjoy work now that I have so much daily variety. It's a valuable lesson that I hope to bear in mind throughout my career. My name is Michele (pronounced mi-KAY-leh) Vallisneri, and I am a scientist at the Jet Propulsion Laboratory. I am part of a team working on a space mission called LISA, the Laser Interferometer Space Antenna. If we work really hard and we are very successful, the mission will be ready for launch ten years from now. All the universe a stage? Anyway, in 1915 Einstein pointed out that spacetime is not just a big stage where "physics" happens, but it is an active player itself; it can bend and warp and undulate! Masses, especially big ones like the Sun, bend spacetime ever so slightly, and gravitational forces occur naturally because the planets and the apple try to move as straight as possible in spacetime--but have to curve, because spacetime itself is curved! 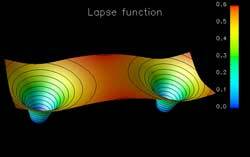 (The fall of the apple can still be seen as a curve, not in space, but in spacetime.) And what about the undulations? When masses move around rapidly, like for instance two stars in a close binary system, they create outwardly propagating waves in spacetime-gravitational waves. You can imagine them as the waves created in a pond when you throw in a stone; except gravitational waves do not move out in circles, but in spheres, and they do not affect the surface of water, but the very fabric of spacetime. If we could listen to these waves, we would learn a lot about the Universe, especially about its dark side, which we cannot observe with telescopes. This dark side is populated by heavy objects that nevertheless do not emit much light, such as the huge black holes at the centers of galaxies, millions to billions of times heavier than our Sun. Since the 1960s, scientists have been trying to detect gravitational waves, but it's very hard, because when they cross the Earth, the waves create only minute perturbations. The best attempt so far is with the giant interferometric detectors such as LIGO (Laser Interferometer Gravitational Wave Observatory), which have "arms" of 2.5 miles to magnify these minute signals. With LISA, we want to bring this quest to space, and create a gravitational-wave antenna consisting of three spacecraft positioned in a triangle, with arms of 3.1 million miles (thirteen times the distance from the Earth to the Moon). We want to go to space because it is so quiet and because you could not do something so big on the ground; also, a big antenna can measure the waves with the largest wavelengths (the distance between two peaks in the oscillations). There are many systems in the Universe that can emit such waves, so once LISA is up, we're sure to hear and learn a lot. So what's it like in our day-to-day work getting LISA ready? It takes many people with different talents, from the engineers who plan the spacecraft launch and trajectories, to the experimental physicists who are testing the optics, lasers, mirrors, and all the widgets that will make the instrument work. I am a theorist, so I am happier with pen, paper (and a computer) than around a lab. I work to prepare mathematical techniques and computer programs to analyze the LISA data, so that once it's in the sky and it starts making measurements, we'll know what we see. 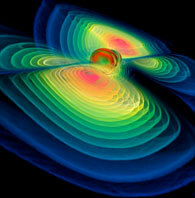 Is it a binary of black holes or neutron stars? How heavy are the components? One aspect of this preparation can be especially fun. Together with many other LISA physicists around the world, we just finished playing a "mock data challenge." A group of us made a set of measurements, just like what we'd get from the real mission, and "hid" some gravitational waves in it. Another group then took the data and tried to get the waves out. There were many surprises! Some of us thought they had found a (fake) binary emitting on one side of the sky, but it was really on the opposite side. It's hard to do science in space, and that's why we must start so many years in advance; but the payoff will be great, and physicists always like a challenge. See the LISA mission website. Hi, Annie Richardson here, and I'm an outreach specialist with the ocean surface topography missions at NASA's Jet Propulsion Laboratory (JPL). Today, all around the world, people are talking about climate change and global warming. We hear about the rise of greenhouse gases in our atmosphere, about glaciers and ice sheets melting, and about global sea level getting higher and higher. For now, let's just talk about sea level rise. Did you know that global sea level has risen more than 3 millimeters (about one-tenth of an inch) per year since 1992? That's a little bit more than two inches in seventeen years. How do we know this? Well, since 1992, to measure sea surface height, NASA and the French Space Agency, CNES have been using radar altimeters on a series of satellites called Topex/Poseidon; Jason-1; and the Ocean Surface Topography Mission/Jason-2. These three satellites are the ocean surface topography missions that I'm fortunate enough to work for. We know that there are two things that cause sea level to rise: First, the ocean is warming, and as it warms the water expands. This is called thermal expansion and it makes the sea level higher. Second, more water is being added to the ocean because glaciers and ice sheets are melting. That melt water flows into the ocean, increasing the mass of water in the ocean and raising the sea level. The ocean surface topography missions measure all the sea level rise regardless of cause, while another satellite mission called the Gravity Recovery and Climate Experiment or "GRACE," measures the change in mass due to new water. The difference between these two measurements tells us what part of the total rise in sea level is due to thermal expansion only. 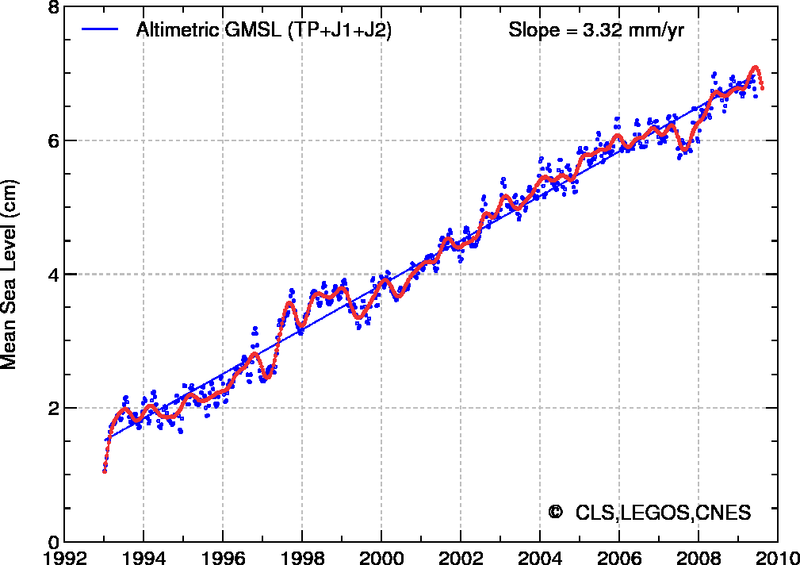 This graph shows sea level rise as measured by the Topex/Poseidon, Jason-1, and OSTM/Jason-2 satellites from 1992-2009. But, you might be saying, "So what's the big deal about sea level rise? Two inches in 17 years doesn't seem like very much at all." Well, here's the big deal. Dr. Bill Patzert, an oceanographer at JPL, says that every inch of sea level rise will cover 50 to 100 inches of beach with water. Bill says that the actual amount of beach loss will depend on the slope of the beach, with flatter beaches being lost more quickly than steep ones. Why is it a big deal? 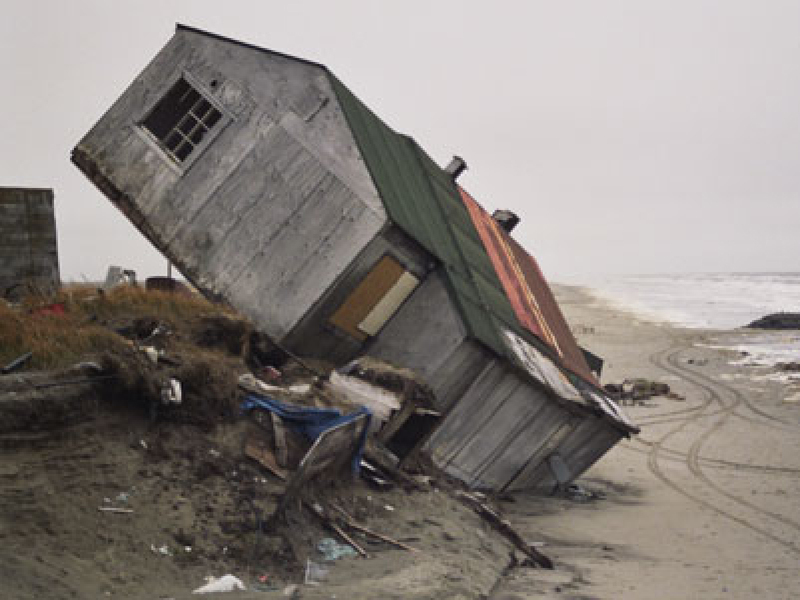 In less than 100 years, sea level could rise 10 or more inches, and we would lose 500 to 1000 more inches of beach. That's 41 to 83 fewer feet of sand between your dream beach house and the surf. Scientists are using the information from satellites not only to measure sea level rise, but to understand how the entire Earth reacts to a warming climate. Satellite observations have really helped improve our understanding of all this, but new questions arise every day, such as "How do we slow down sea level rise?" That's where the next generation comes in. We need many more new scientists to help answer the questions about our changing planet. Who knows? It just might be your kids or your students who can protect that beach house and save the sand castles for the kids to come. Check out this classroom activity that demonstrates how the sea-level-measuring satellites use the Global Positioning System. Here is an explanation of El Niño, along with a yummy dessert recipe for "El Niño Pudding". Hi. 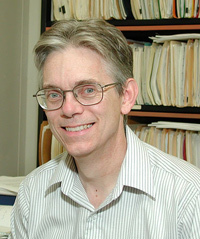 My name is Don Neill, and I am a post doc at Caltech. I am part of the GALEX team and we all get to look at the images taken by the GALEX ultraviolet imager of faraway galaxies. One day, I got an e-mail from my colleague, Karl Forster. When I opened the image attached to his message, several thoughts went through my mind. First, this must be some kind of artifact--an error introduced by the limits of the instrument. Second, what object is this? Third, if this isn't an artifact, this is something new. After checking the coordinates and discovering that the object in question was the venerable variable star Mira, I starting considering that this was indeed something new. What the image showed was a glowing flow of ultra-violet emission surrounding a star that was not quite bright enough, to my eye, to produce the kind of artifacts that sometimes surround the very brightest stars when their light exceeds the camera's capacity to record an image accurately. Mira is a very old, red star and should not produce that much light in the ultra-violet part of the spectrum (which scientists refer to as UV). After several exchanges of e-mail between a few of us on the GALEX team, we gradually accepted that this glowing halo around Mira was a genuine new UV phenomenon. We agreed that we needed to trace the extent of this UV glow, which appeared to extend beyond the edge of the original image. Over the next few weeks, Karl added the required observations to the schedule. 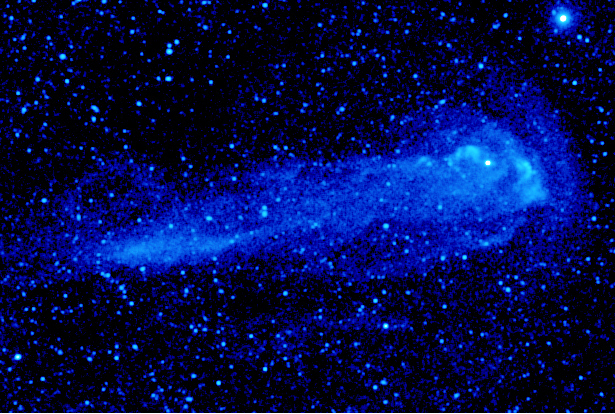 As these new images arrived, it became clear that this new feature of Mira included a long straight tail over two degrees long, or four times larger than the width of the full moon, making Mira appear like the nucleus of a comet. 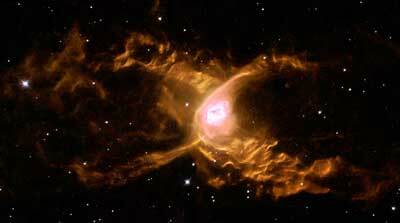 We began to discuss ways to explain this amazing tail on the old star. The clues were already in the original image. Looking more closely at them, we saw that the southern edge of the feature looked like the wave that appears in front of a fast-moving boat—what physicists call a "bow-shock." Such a feature combined with the two-degree "wake" would make sense only if Mira were a fast-moving boat with respect to the thin gas between the stars of our Milky Way. So we looked up any and all measurements of Mira's motion. After accounting for the published motions of Mira and the motion of our own Sun, we found that Mira is indeed moving fast through the Milky Way "waters." More like a bullet, this shooting star is moving at well over 800 miles per second through our galaxy. This fast motion, combined with the fact that Mira is literally shedding its atmosphere, as many old stars do, produces the bow-shock and tail that had gone undetected through over 400 years of observing this well-known star. As we wrote up our results and released our story and the new UV images of Mira to the world, I felt a deep satisfaction at having participated in a true discovery. I was not prepared, however, for the reaction to our results. People all over the world were captivated by this shooting star. We started finding our images popping up in popular science web sites in Russia, Japan and Europe. Several members of our team were interviewed on television and by numerous journalists. The National Geographic Channel based an entire episode of their show "Naked Science" around our Mira discovery. I learned from this experience that discovery leads to adventures of all kinds. I keep scanning our GALEX images hoping to have another chance to participate in the thrill of discovery and the adventures that this discovery will lead to. The Space Place has a kid-friendly description of Mira, a "real shooting star,"
The GALEX website has lots of other amazing discoveries and images. Who says these spacecraft are unmanned? Time out brings gratitude for "routine"
Welcome to Space Place Live! Bad (space) weather cancels pigeon races!